A fresh spin on an age-old recipe. 1. Preheat oven at 350ºF. 2. 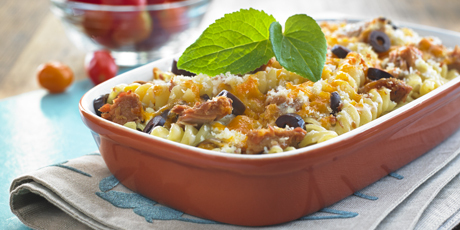 In a mixing bowl combine pasta, tuna, cheddar cheese, green onions and olives, mix well and pour in a greased baking pan or oven safe fry pan. 3. In a small saucepan, heat the evaporated milk and add cream cheese stirring until cheese is melted. 4. Pour milk and cheese mixture over pasta and coat with bread crumbs. Bake uncovered in a 350ºF oven for 30 - 35 minutes. 5. Chef’s Suggestion: This recipe works really well with salmon as well.